Located just a few minutes from stunning Four Mile Beach and the famous Reef Marina, The Pavilions offer self-catering accommodation. Ideally located close to a range of local activities and attractions, the resort also offers easy access to Tropical North Queensland including the Great Barrier Reef, the Daintree and Mossman Gorge. Accommodation at The Pavilions offers a range of well-appointed Studios and 1 bedroom boutique apartments that feature all the modern comforts including air conditioning, TV, kitchenette facilities (1 and 2 Bedroom only), spa baths and private balcony or courtyard. The Mediterranean theme and decor of the resort creates a relaxed and enjoyable ambiance. The Pavilions is also home to a great range of onsite leisure facilities including a lap pool and spa, an entertainment deck complete with BBQ facilities, laundry services, secure undercover parking, a tour desk and more. The resort is also conveniently located close to the boutique shopping, contemporary art galleries and world class dining of Port Douglas. Accommodation at The Pavilions offers a choice of well-appointed Studios and self catering 1Bedroom Apartments. Studio: Features private terrace. Bedding is 1 Queen Bed. Maximum room capacity is 2 Adults & Children. 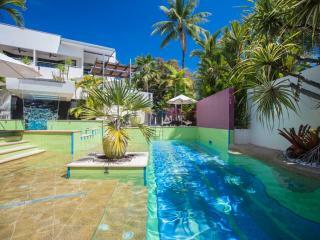 The apartments at The Pavilions are perfect for an extended stay in Port Douglas. 1 Bedroom Ground Floor: Features kitchenette facilities. Bedding is 1 King Bed OR 2 Single Beds. Maximum room capacity is 3 Adults & Children. Accommodation at The Pavilions offer self-catering kitchenette facilities however there are also a fantastic range of bars, cafes and restaurants just a short stroll from the resort. There are also a delightful range of evening cruises or dinner tours available. Children: 3 years and over are charged at the adult rate. Children under 14 years are not encouraged at this property. Excellent location in the middle of the main st. So close to everything. Rooms a little dated but certainly adequate and great value for port douglas. Fabulous - convenient to town. Quiet. Friendly staff. Comfortable. Rooms could do with a refresh but otherwise fantastic and will recommend to others.